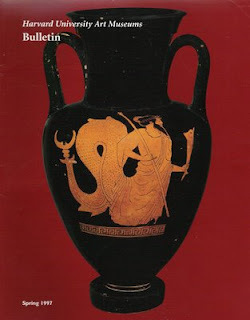 I have earlier commented on the 1995 purchase of more than 200 Apulian, Attic, Chalcidian, Corinthian, Etruscan, Laconian pot-fragments. (There are 182 catalogue entries in the Harvard University Art Museums Bulletin representing the exhibition at the Fogg Art Museum, 15 March - 28 December 1997.) This acquisition is discussed briefly in James Cuno's Who Owns Antiquity? These had been collected by J. Robert Guy, currently Humfry Payne Senior Research Fellow in Classical Archaeology and Art at Oxford. As far as I can see this is the sum total of the "history" - or Cuno's less precise "provenance" - of the pieces. The catalogue (prepared by Aaron J. Paul) does not appear to provide any further information. Who was the dealer? What was the additional information? What were the sources for the pieces? Is it certain that the fragments were known prior to the 1970 UNESCO Convention?